Running a nursery doesn't allow us much time off; there is always too much needing done. It shouldn't be this way, of course, but it is, so we just get on with it. We did take a holiday once - I think it was 1995 - but we haven't felt the need for another one! We take a day here and a day there as our workload and the weather allow. To most people - those who are employed - this may seem very odd, especially if they only work a 39 hour week, every weekend off, get public holidays, statutory holidays, paid sick leave etc., but people who run small businesses and care for plants or animals need to live to a different rhythm. Anyway, I was forced into taking a few days off last week. One day, I needed to take my father to hospital for his check-up. Another, I went to a local trade show. Then I had a migraine followed by the cold (not a good combination - if you suffer from migraine, you'll know what I mean!). So, over a few days I didn't really get much done on the nursery and we were really just seeing to the basics. Cuttings OK, no plants dried out, nothing blown away, no sign of rabbits etc., etc. Sometimes, this can be a good thing. When I spend all day looking at the same plants, day in, day out, they never seem to grow much. They are growing, but just too slowly for me to register. But take a day off, especially during the active growing season and I return to a nursery full of Triffids! Occasionally, plants can disappear too. This pretty little pink and yellow flower is Oxalis depressa, a nice little alpine which grows from little underground 'bulbs'. And mice like them! 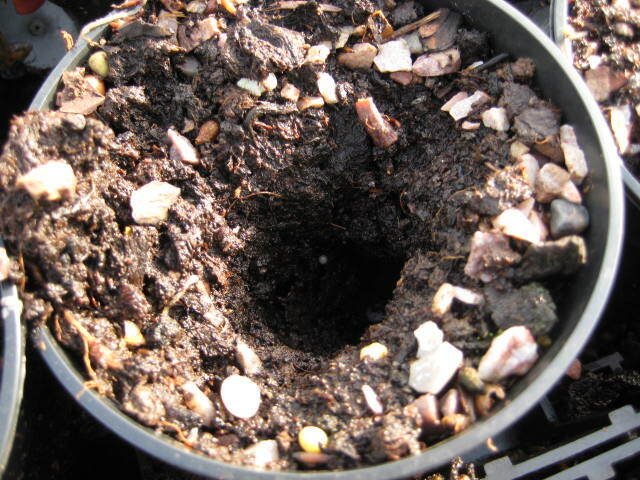 Well, they have this year - every pot has a neat little hole excavated where the mice have dug for their dinners. I had a good stock of these too (about 100 plants) which I have been slowly building for the last few years; they don't multiply quickly. Ah well, win some, lose some - or in this case, lose all. I will be surprised if there are any are left but we do have a large pot set aside which may, rodents allowing, let us offer a few Oxails depressa for sale next summer. Time off? It's just not worth the risk!